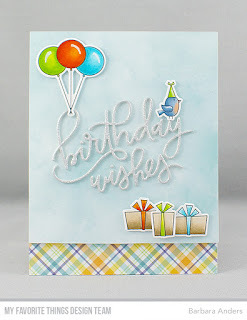 Paper Pursuits: MFT February Release Countdown, Day Two! Hello and welcome back! 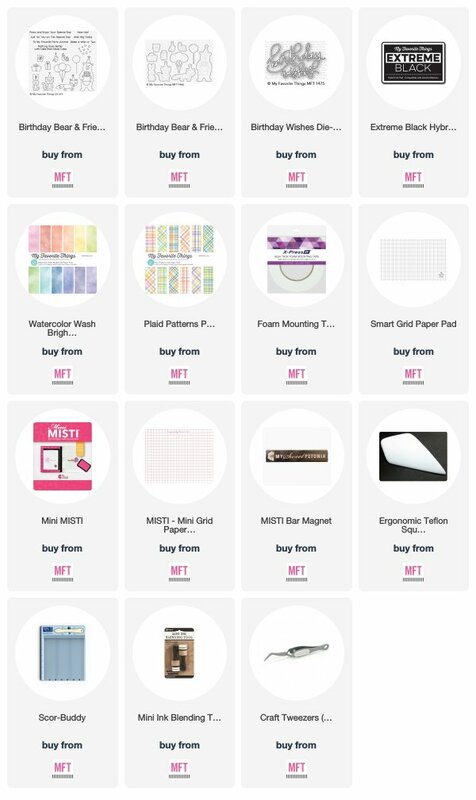 Today is Day Two of MFT’s February Release Countdown and we have a super fun line up again today. 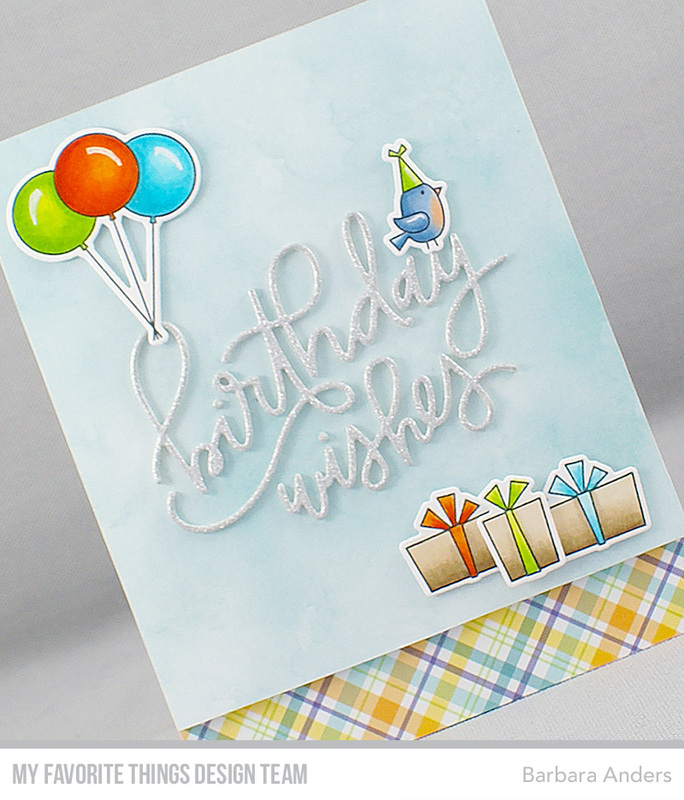 Today we’re previewing Birthday Bear & Friends Stamp Set, Birthday Bear & Friends Die-namics, Card-Sized Confetti Stencil Set, Birthday Wishes Die-namics - Free with $60, For the Record Stamp Set, and Turntable Die-namics. Don’t forget that release is tomorrow at 10am, Eastern and be sure to stop by the MFT Blog for all the detail. OMGoodness! Are you kidding me! This Turntable Die-namics is so stinkin’ CUTE! And For the Record Stamp Set has the most perfect sentiment to go with it! I love this!!! I started by constructing the turntable. I used a wood sheet for the base and cut the record from shiny black cardstock. 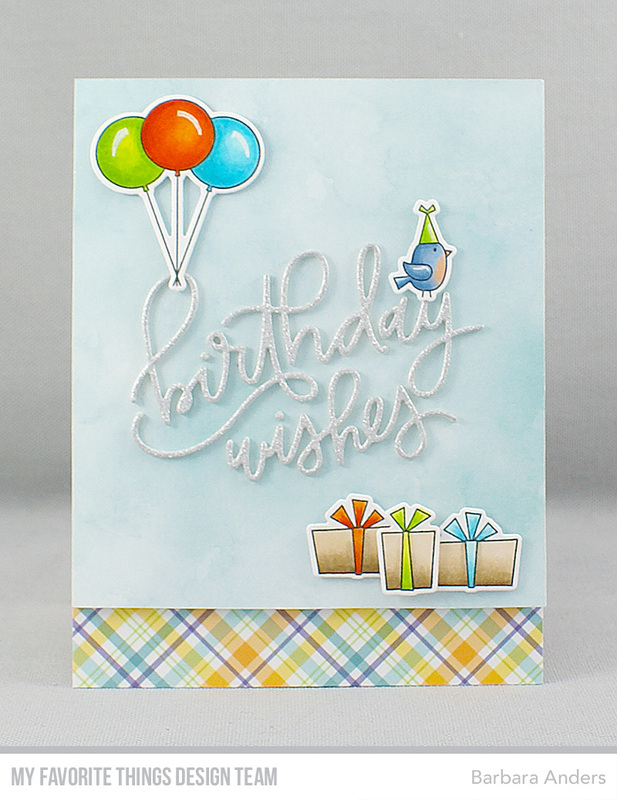 The “label” was some paper I had in my stash stamped with Happy Birthday Background and I put a drop of Nuvo silver in the center for the spindle. I also used the small circle for three knobs. Once it was done I set it aside and worked on my card base. For the base I used Sweet Tooth card stock and stamped it with Musical Notes Background in Extreme Black hybrid ink then splattered it with MFT dye inks in a rainbow assortment: Wild Cherry, Orange Zest, Lemon Drop, Sour Apple, Blu Raspberry, and Grape Jelly. I just watered it down a tiny bit and splattered it with a small art brush and I love that it provided just the right amount of color to an otherwise neutral color palette. When that was done I popped the turntable up on foam and added the heat embossed sentiment and some Musical Notes Die-namics. For my second card I used Birthday Wishes Die-namics and a few elements from Birthday Bear and Friends Stamp Set and Die-namics. Again, I started with a Sweet Tooth card stock base, added some Plaid Patterns Paper Pack across the bottom, and popped up the card front, covered with Watercolor Wash Brights Paper Pack, on foam tape. Then I cut Birthday Wishes Die-namics from Silver Sparkle Card Stock and twice from white paper scraps and adhered them together form dimension. This is a narrow font die cut so, yes, it was a bit tedious but I use spray adhesive for this which allows for some adjusting. When that was done I adhered it to the card front. Then I stamped the images, cut them out with the coordinating Die-namics, and colored them with Copic markers before popping them up on foam tape, as well. And that’s it from me today! Thanks so much for stopping by! See you back tomorrow for Day One of MFT’s February Release Countdown! I agree with your assessment. "OMGoodness! Are you kidding me! 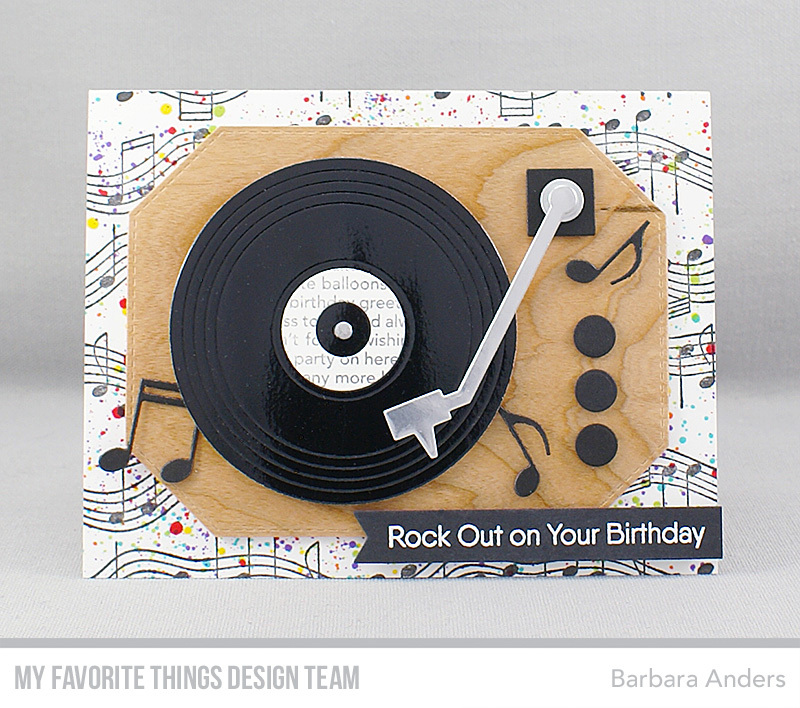 This Turntable Die-namics is so stinkin’ CUTE!" Love the "For the Record" sentiments and the "Turntable Die-Namics!" Both cards are great but really loving that turntable! I LOVE LOVE LOVE your record player card! Genius!! I will be buying the stamps/die as soon as they're released. I love that you put subtle color on a basically mono chromatic card...it makes the card so much more fun! I always need color! I love them both but the turntable is - well, coming home with me, for sure. Both cards are so cute. Loving the turntable die! Fun, fun cards Barbara! They are both sweet, but that record, turntable card caught my eye right away. Love the sentiments you used on it. Thanks for sharing. Yeah! 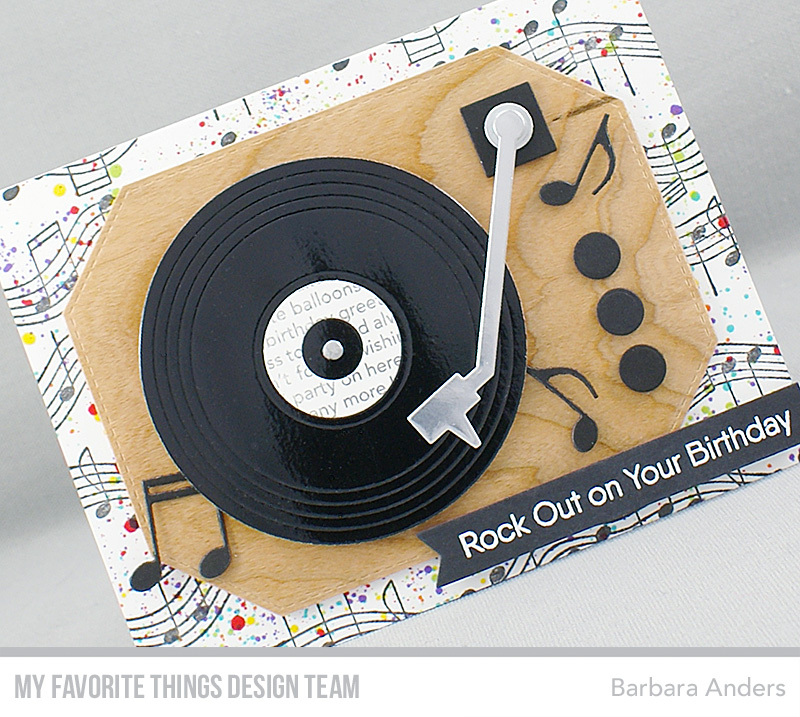 A terrific record player card with music! I absolutely love the turntable card. It is so cute. Like the way you did your background.